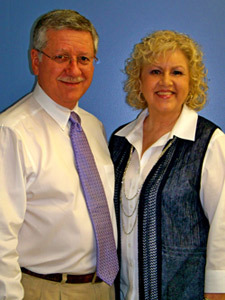 Dr. Larry Heaton and his wife Cindy. For years my son suffered with Asthma. He carried two inhalers and took two types of medicine. We went through three Pediatricians and two Allergy Specialist and he still had asthma. Our friends said ” Take him to our Chiropractor.” Well, I finally said yes. After I saw the great results my son had with Chiropractic Care, my wife our other son and myself soon became patients. Next thing I know, I was enrolling myself in Chiropractic College to become a Doctor of Chiropractic. Before choosing to become a Chiropractor, I spent two years in the Army and worked at Westinghouse Electric. I studied at Life Chiropractic College, the world’s largest Chiropractic Institute. In college, I was extremely surprised at the concentrated depth of Anatomy and Physiology classes. I am an energetic and enthusiastic Advocate of the powerful natural healing benefits of Chiropractic, Nutrition and Exercise. I am attempting to give every patient the opportunity to experience True health. I offer patients a choice that some have never experienced before. Some of the most moving, soul satisfying and deeply fulfilling aspects of my practice have been working with people who felt they had to live with their problem, when they didn’t. From children who had torticollis to adults with severe arthritis. My wife, Cindy and I moved from south Alabama to Decatur to be closer to our children and grandchildren. After 37 years, we like to travel and we love going to the beach. I love to go to Antique car shows. I also had a 1965 Mustang restored some time back. I consider myself an excellent listener and hope I get the opportunity to meet you in person and discuss your specific health challenge. Call Heaton Chiropractic Center today to make an appointment!